A reproduced 1961 article on fruit picking at Dan Ward’s farm in Witchford, Cambridgeshire. Highlighting my love of using newspapers in research, I found this article on fruit picking in the orchards of Dan Ward in Witchford, Cambridgeshire, England. Whilst it contains a nice insight into village life and agriculture, it includes photos of, and quotes from, my Great Grandmother Louisa Pope, and her youngest daughter Audrey Giddens. So, here it is 54 years on, re-created for the web, with original headline. It was published in the Saturday Pictoral on July 29, 1961. Mrs. M. Coe shoulders her ladder and sets off to start picking another tree. In the last fortnight the fruit picking scene in the Fens has changed. Changed from the back aching grind of strawberry picking to the arm stretching task of plum picking. So drastic has been the change, that in parts of the Fens growers were gathering in the first part of the plum harvest at the same time as Wisbech growers were finishing off ‘the straws’. In the most southerly parts of the Isle, fruit growers have been picking plums earlier than ever before. Not only have they completed the programme of early varieties but they are well ahead of schedule with the Czars as well. Bowls player and Special Constable, Mr Dan Ward checks over the crop. “This year is even early by our standards”, explained Mr Dan Ward of Witchford – certainly the ‘Little Kent’ of the Fens. “We have got all the Rivers Early and some of the Pershores off and now we are well on the way with the Czars – a later variety – and by Monday we should have a full gang of about 30 on the gardens”. But although the plums have come early in the Witchford gardens – the locals use this term instead of orchard – the crops are not as heavy as they might be. Whereas, Mr. Ward has had 40 or more pickers in other years, he will be able to make do with far less this season. But that does not take the shine off the crops for the pickers for plum picking is obviously a time of year that they look forward to very much. When we called in at the Ward farm this week we saw them busy at it and obviously enjoying every minute of it. But it is only at Dan Ward’s that the Witchford people get the chance to do any amount of plum pulling. There is hardly another big orchard in the district – the next nearest centre being at Wilburton. I asked Mr. Ward how he came to be a fruit grower in such an area. “As long as people can remember the Ward family have been growing fruit in Witchford”, he explained. “My grandfather and father before owned the gardens that I have now. I think that the industry must go back more than one hundred years in fact”. Despite the fact that the land has been in the Ward family all this time, most of the trees in the orchard are young. Mr. Ward went on to explain that he has replanted several acres – getting the trees from the Wisbech area. Not only the trees but the end product as well have connections with Wisbech. Much of the fruit comes to Wisbech before being shipped off to various markets. Having so many plum trees in an area where fruit growing is not regarded as a major industry could present problems to some people – but not to Mr. Ward. The organisation during the peak season at Witchford is equally as good as that at Wisbech and he has his own regular pickers who come each year to tackle the crop for him. Mrs. L. Pope may not look a bit of her eighty years but as she says – “you are as young as you feel and if you keep working you always feel young”. She has been working on the Ward’s fruit farms for over 50 years and really enjoys the plum picking season. One of them is Mrs. L Pope – who has been working in the plum gardens for over 50 years. Mrs. Pope picked from the ladders at the tops of the swaying trees last year and quite expects to repeat the performance during the next few weeks. She claims that it is the outdoor life and plenty of work which keeps her looking fit and young – she is actually over 80. One of her daughters, Mrs. A Giddens, is following in her footsteps. As Mrs. Pope was picking from the ground when we were there, Mrs Giddens was towering above her on one of the ladders. Mrs. A. Giddens reaches high for plums. This sort of work gives the women of Witchford a good head for heights and a chance to get out in the open air. Monday will see the season rise to its heights. Pickers, baskets and plums will pour in and out of Dan Ward’s gardens and Witchford produce will take its place beside fruit from all other parts of the country in the nation’s major markets. So keeping up a centry-long tradition in the Ward family. When dinner time rolls round the workers take things easy. They find a bit of shade and have a nice quiet drink and a rest. Within minutes of this picture being taken, they were all swarming up the trees again. Pictures taken by staffman Harry Naylor. Surname Saturday: GILBERT – The Gilbert family of Huntingdonshire and Cambridgeshire are the focus of this week’s meme day. This week’s Surname Saturday post is that of my paternal Gilbert family. 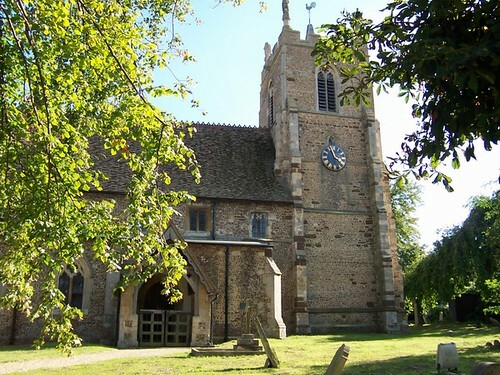 My connection is through my paternal Great Grandmother, who was born in 1884, in Littleport, Cambridgeshire. With the help of the research of distant relative Colin Tabeart, the tree has been found to stretch back through time as far as 1694 when the family turns up in Abbotsley, Huntingdonshire (now part of Cambridgeshire). It is here that they are noted in the parish records and taxation records. It appears that the earliest Gilbert I’ve found (with, as yet, an unproven connection) was in Abbotsley, Huntingdonshire in 1605, when a John Gilbert takes his daughter Maria to be baptised in the parish church of St Margaret on 24th February. St Margaret’s church at Abbotsley, Cambridgeshire. By the beginning of the 18th century, the Gilbert families in Abbotsley were booming with each seemingly having at least 9 children, and up to as many as 13 children over a 24 year period – as was the case of James and Anne Gilbert between 1752 and 1776. In 1767 at Abbotsley, Elizabeth Gilbert (née Hale) – the widow of James Gilbert – is noted as paying a Land Tax of £1, 19 shillings to a Mr Robert Edsope. In 1828, the son of my Gilbert line – William – leaves Abbotsley and heads about 40 miles North East to Littleport in Cambridgeshire, where he married Elizabeth Brightly. 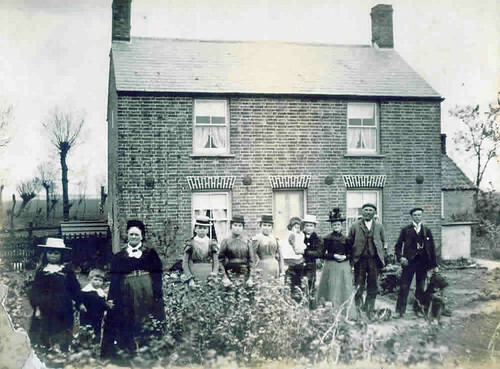 The couple settle down in Burnt Chimney Drove – an area of rich agricultural fenland just to the North West of Littleport, where William becomes a farmer. The couple bear 12 children, although sadly a few of these don’t survive their early years. Whilst William’s relocation may well have been because of his love for Elizabeth, his parents – Edward and Susan Gilbert have fallen on hard times – by 1851 they are both noted as ‘paupers’ and are living with their daughter Mary and her husband Thomas Cade. Susan has become blind, but goes on to live another 8 years. Edward only lived until 1852. Despite this hardship, William and Elizabeth were making progress for themselves and managing to live outside of poverty thanks to farming. Their 9th child (also Edward and Susan’s grandson), James, was my Great Great Grandfather, and he survived his two older brothers. In doing so, and in an act not unusual or unlike primogeniture, he inherited his father’s farm in 1879, which by 1871 had grown to 40 acres and employed one family. By this time, James had got married to Elizabeth Howlett – and they had already bore two of their eventual family of nine children. The family still lives and farms in the area today. 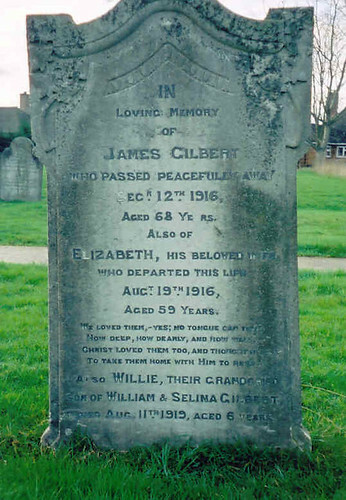 James and Elizabeth Gilbert’s Gravestone, originally uploaded by familytreeuk. This headstone stands in the cemetery in Littleport, Cambridgeshire. The Gilbert family were and are land owners in the area. The stone shows that Elizabeth and James died close together – perhaps one of a broken heart? Willie Gilbert is their young grandson. One of the family trees that I am currently climbing has a bit of an evolutionary name. The most recent incarnations in the late-19th century are ‘Brightle’, ‘Brightley’ and ‘Brightly’ as found in Littleport and Little Downham fenland, Cambridgeshire. The latter two are clearly pronounced ‘bright-lee’ as in, ‘well lit’, but the first version seems a little odd. Perhaps it still is ‘Bright-lee’ but with just one ‘e’. However, after stumbling across a note that my ancestor John Brightly was born in ‘Elden, Suffolk’, I decided to see what I could find. Not only did he have this changing surname that I wanted to follow, he was also from outside the county – which in my genealogy is quite rare. I already had a hunch of where ‘Elden’ was but checked it out on Genuki, which confirmed my suspicions. Much to my delight, my ancestors appeared to be from the same Suffolk village that I had grown up in, gone to school in, and enjoyed living immensely – Elveden, on the Norfolk/Suffolk border. I havent’ lived there for more than 20 years now but this chance coincidence feels like a full circle! Do you ever get that sense of pride or excitement when you visit a place that your ancestor would have known well? Fortunately, the village is in Suffolk and also classed as West Suffolk, which means that the parish records are deposited at the record office in Bury St Edmunds, so I knew I could easily pay them a visit to check up on the claim of John Brightly’s birthplace. I found ‘Brightwell’ to be the chosen spelling, and several family members were listed in the births, marriages, and burials – including a Robert Brightwell noted as being a farmer in 1785. ‘Brightwell’ fits with the ‘Brightle’ spelling – if you think of it being pronounced as ‘Bright-all’ – not far from ‘Brightwell’ which with an accent could easily sound like ‘Bright-wall’. The parish records are copied onto microfiche and it was easy to claim a reader for use. Unfortunately, the mid-late 1700’s registers were subject to some fading (or bad microfiching!) and some dreadfully wafty and artistic handwriting from George Burton the Rector. The earlier entries from the 1600s were immaculate though – clearly written, well organised, and the spelling was perfect. After collecting up a few Brightwell entries that I could glean from the microfiche I departed, pleased to think that my Brightwell ancestors had lived in a place that I enjoyed living so much, and that I had re-trod their steps quite literally and obliviously by chance, some 200 years after them. I was also interested to see in the 1700s, that the village was home to three family names that were there when I was a child and I think are still present there today: Harper, Turner and Gathercole – That’s more than 300 years of their family history!